Mobile vehicle wraps are one of the best advertising methods on the market today. They are affordable, simplistic and creative. Mobile vehicle wraps are also convenient because you can have them removed at any time. If you operate a business and you’re serious about taking charge of your advertising, consider vehicle wraps and fleet wraps from Apple Graphics for your company vehicles. Apple Graphics is the leader in both the Bucks County and surrounding Philadelphia area. Give them a call or stop in to find out more about how they can help your business thrive in the New Year. With so many businesses competing for advertising attention nowadays, it’s a wonder that many small companies can even stay in business. We’re bombarded with Internet ads and we often have little time to read them, anyway. This is where mobile graphics come into the picture. Ignoring a mobile graphic is almost impossible. They’re conveniently wrapped on a vehicle or a fleet of vehicles and they send a clear, positive message for whatever business they represent. In this day and age, mobile graphics are simply the most innovative, cost-effective and creative way to advertise. At Apple Graphics, we can help you decide on the perfect mobile graphic options for your business. If you only need a custom wrap for one vehicle, we can handle it. Likewise, if you need a fleet of vehicles wrapped and you have a specific logo or image that you’d like to use, we can handle that, as well. Apple Graphic is always ready to help you come up with the perfect design for your brand, even if you’ve never given it much thought until now. Our talented team takes pride in offering the best mobile graphics available and they are always willing to answer questions that you might have about your individual project. Fleet graphics from the team at Apple Graphics are the best way to advertise and at Apple Graphics, they are also the most creative and affordable graphics on the market. Our design professionals will always work closely with you as a client until you are absolutely satisfied with the completed project. Stop in today or give us a call to find out what we can do to get your fleet decked out in some beautiful, fully customized vehicle wraps from the crew at Apple Graphics. Our team can get your fleet ready for the New Year in style. Are you wondering what you can do for your business to start the New Year off right? At Apple Graphics, we are always looking for ways to help our clients increase their brand awareness. 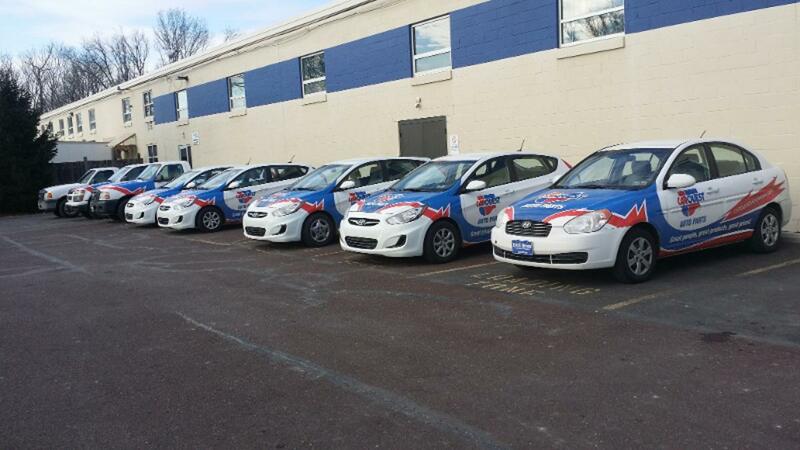 We know that it pays to have the best advertising plan available, which is why we suggest graphics for your car or for your fleet in Bucks County and Philadelphia. Apple Graphics is the leading mobile vehicle wrap company in the entire area. We take pride in all of the car wraps and the fleet wraps that we install. At Apple Graphics, we can help you work on a design that will represent your business in the best way possible. We can also help you work on an existing brand so that it speaks to your personality and your business mission. If you need help creating a design, our professional designers will help you come up with something that you can feel proud advertising. The expert designers at Apple Graphics always provide exceptional service and they are always willing to help answer questions about your project goals. Stop in or call Apple Graphics and find out how you can benefit from our custom vehicle and fleet wraps. Whether you use a car for your business or whether you use a fleet, at Apple Graphics we can make sure that you find a design that will work great for your business goals. With a car wrap from Apple Graphics, you’ll benefit from the results of mobile advertising and you’ll have the chance to find out what simplified advertising is all about. Forget print ads that get overlooked in the Internet age. Opt for something innovative and affordable with a mobile vehicle wrap from the team at Apple Graphics. Start the New Year off right with a custom vehicle wrap from Apple Graphics. Our professional team takes the time to ensure that each design is created to your satisfaction, so there’s never a need to worry about design or cost. We can work with a wide range of idea and budgets and we are always ready to lend an ear if you have ideas you’d like to discuss. Apple Graphics provides excellent customer service as well as convenient hours for customers who want to invest in vehicle wraps or fleet wraps. Stop in or call today to find out how we can be of assistance. With Apple Graphics, you’re bound to find exactly what you need for your business.